The National Library’s theatre is quite unsuited to dance. It is a lecture theatre really, although capable also of acting as a cinema. It has a small, oddly-shaped area at the front of an auditorium that holds about 300 people. The auditorium is raked but anything that is ‘grounded’ movement is difficult to see unless one is sitting in the first few rows. Liz Lea did her best to accommodate the space and its severe limitations. From a practical point of view, for example, a small dais allowed some movement to be seen to better advantage, and she had some lovely black and white screens at each side of the performing space that allowed the performers to change costumes at various points. But I think she did herself a disservice by performing InFlight in the National Library Theatre. InFlight is in two parts. Part I, ‘Aviatrix’, is inspired by the exploits of Charles Kingsford Smith, Charles Ulm and female aviation pioneers, the British woman Amy Johnson and the American Amelia Earhart. 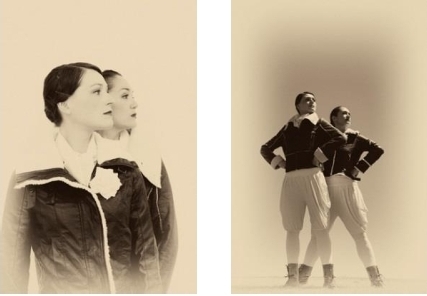 In this section, four dancers play out a fantasy of becoming aviatrixes themselves. The choreography was severely limited by the space available. I enjoyed the dance that opened the show, a 1920s–1930s style number with fabulous black and silver costumes and gorgeous red and black feather fans. But so often the dancers, Melanie and Marnie Polamares, seemed to be just moving on the spot. It did however serve its purpose well by setting the scene in the era of pioneer aviation activities. The audio-visual material screened throughout Part I included the voices of Ulm and Kingsford Smith, footage of Johnson and others, still photographs of them all (interspersed with photos of the dancers dressed in aviation gear), and contemporary newspaper headlines. There was so much audio-visual material that the choreography became a side issue. This section seems to me to be more suited to being shown as something other than a dance performance. A history lesson about pioneering moments in aviation? Part II, ‘Aviary’, leaves aviation history behind and the four dancers are transformed into birds, staking out a territory and building nests. Miranda Wheen’s solo was a highlight as she, wearing an elegant long white dress and manipulating two large white feather fans, sought a place to build her nest. Alison Plevey, dressed in red, also made a mark in another solo as a more aggressive bird. But again there was just no room for the dancers to move and no way for the audience to enjoy Lea’s usually expansive choreography. Naomi Ota’s feathery, trailing installation also got a little lost. It needed space to be seen at its best (some of it had to be hung along a side wall), and space for the dancers to manipulate it effectively. The ending was a bit of a mystery to me. Something was carried onstage in what seemed to be a piece of bark. This moment in the story was performed with great solemnity. Lea has a great eye for the theatrical and a wonderful capacity to use all kinds of unexpected additions to her shows. But basically she is an artist working in the medium of dance. Dance doesn’t really exist without choreography and if the choreography is compromised in the way it was in InFlight, both by lack of space and by being overshadowed by audio-visual material, the show becomes something else. Perhaps it doesn’t matter? However, I think it does in this case because Lea’s choreography deserves to be seen in a situation that allows it proper range. Whatever were the political needs of performing it at the National Library, it is impossible for me to ignore the fact that Lea did herself, and her four very accomplished dancers, a disservice. Postscript: The photocopied handout/program did little to make me feel better about the show. It contained many of the errors that creep in when one does a cut and paste to a document and then doesn’t check and recheck for extraneous words. It was an unprofessional publication. For more about the background to the show see ‘Come fly with me’.